Mella Rothwell Harmon, M.S., is an independent consultant specializing in architectural history and historic preservation. As an adjunct assistant professor in the department of Anthropology at the University of Nevada, Reno she taught Nevada history and historic preservation planning. In her former role as Curator of History at the Nevada Historical Society, she was responsible for the development and implementation of museum exhibitions in both the permanent and changing galleries as well as the Society’s public programming. Harmon is widely published in the fields of Nevada history and architectural history. Her master’s thesis, Divorce and Economic Opportunity in Reno, Nevada during the Great Depression, examines the participation of local citizens in Reno’s famous divorce trade. 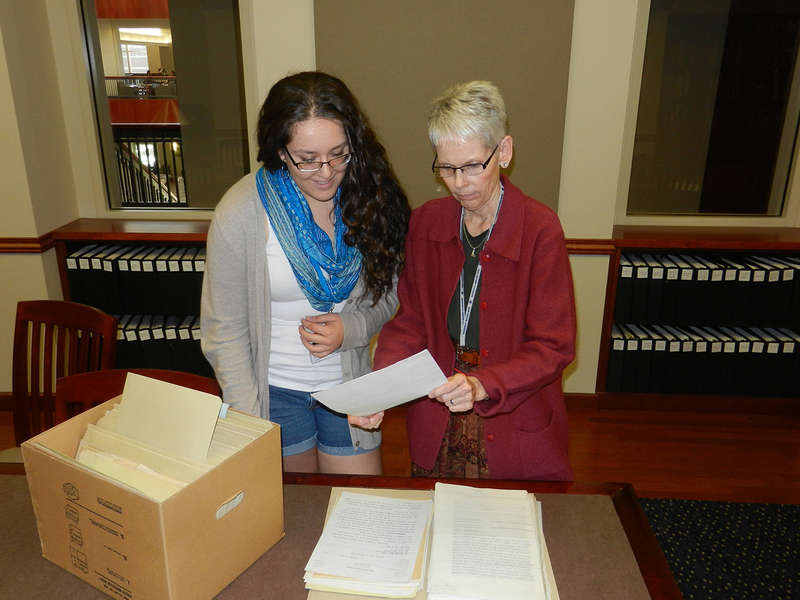 She brought her own collection of photographs, articles, books, documents and other Reno-divorce-related items to the project and donated them to Special Collections when she left. Donnelyn Curtis has been the Head of Special Collections since 2008. She develops exhibits, both on-site and online, and leads digitization efforts that increase access to historical Nevada materials. She also oversees the Basque Library. She wrote the text and captions for Historic Photos of Reno and co-edited Before the Big Bonanza: Dan De Quille’s Early Comstock Accounts. She manages the Reno Historical App project that was partially funded by a 2013 LSTA mini-grant and a Nevada Humanities grant, and was the PI for a large LSTA-funded Special Collections project “Revamping Access to Special Collections Photographs.” More information is available on her website. Alicia Barber, Ph.D., is a writer, historian, and founder of the historical consulting firm Stories in Place LLC. She collaborates frequently with government agencies, museums, artists, architects, and community groups to create dynamic public history projects about Nevada and its people. For a decade, she taught at the University of Nevada, Reno, where she directed the University of Nevada Oral History Program (UNOHP) from 2009-2013 and steered the creation of the UNOHP’s online database, which launched in May 2013. The editor and co-founder of Reno Historical, a smart phone app and website dedicated to Reno’s history, Barber serves on the Nevada State Board of Museums and History and the Board of Directors of Preserve Nevada, and chairs the City of Reno’s Historical Resources Commission. She is the author of Reno’s Big Gamble: Image and Reputation in the Biggest Little City as well as chapters and articles for both scholarly and popular publications. Her website, blog, and a full CV can be found at www.aliciambarber.com. The Nevada Historical Society and many individuals were generous with their historical photographs and other materials, considerably enriching the exhibit. Kimberly Roberts and Michael Fischer have helped with dates and captions for photographs. We give special thanks to the men and women who came forward to offer their remembrances and mementos of Reno during its years as a divorce mecca. Our interviewees very generously allow us to share those recorded memories here. The photographs and documents they shared can be seen throughout the exhibit.